The school re-organization continued in 1956 with the opening of the Westgate Junior High and Elementary School. LaCroft Elementary School opened at that time also. Then there were 5,200 students in the school system. When the Westgate Building opened several old schools were closed including 3rd Street, 6th Street, Grant Street, Walkers, Washington and West End. St. Al's added to their school with a lovely addition in 1957. In 1968 the re-organization continued with the new high school complex and the 3 new elementary schools. At this time, the other elementary schools were closed. Those were: Glenmoor, Pleasant Heights, LaCroft, Taft, Lincoln, McKinley, Horace Mann, Garfield, Neville, and Klondyke. The LaCroft Building which opened in 1956 became the Kindergarten Building. Taft School was remodeled to become the Administrative Offices. Paul Blair assumed the superintendency after the death of Ralph Betts in 1963. The High School at 4th and Broadway was sold to Kent State. The Central Building was sold and then razed. The clock from the old tower will someday stand again on the same lot that has held school classes from the very beginnings of this community. Mr. Blair continued as Superintendent until 1970 when he stepped down because of health problems. Dominic Amedeo served from 1970 until mid-term 1976 when Mr. Blair again became acting Superintendent. Richard Jordan was appointed Superintendent in July 1976. During Mr. Jordan's service the re-organization continued. In 1978 all 9th graders traveled to East Campus formerly East Junior High School, for classes for themselves. At the same time Westgate Junior High became East Liverpool Middle School for all 6th, 7th and 8th graders in the system. At that time the Kindergarten students attended the buildings nearest their homes. In 1982 East Campus was closed and all 9th graders attended the high school making it a four year program again for the first time since 1954. 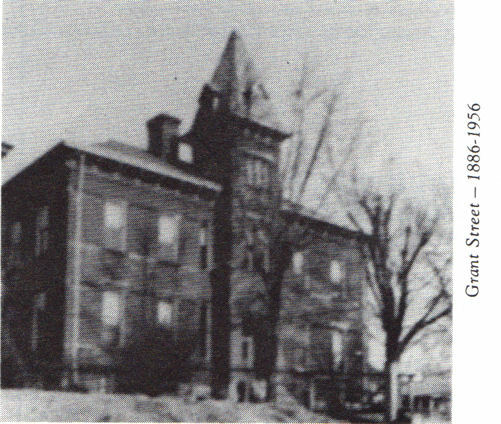 Presently the Westgate complex of Westgate Elementary and East Liverpool Middle School is the oldest building in the system. The East Junior High School building is rented out to the Ohio Valley Business College and the East Liverpool Area Co-operative Pre School as well as other endeavors. On August 1, 1984 Thomas	P. Ash was elevated to the Superintendent's position upon the retirement of Richard Jordan.